The zoom cameras are very popular and most sought out by people starting out with photography Be it Sony, Canon, Nikon, Panasonic or Fujifilm — each one of these is serving the consumers with updated line-ups in terms of extended zooming capabilities in their compact cameras. Sometimes referred to as bridge cameras, these cameras bridge the DSLR gap by providing fancy & advanced features and whooping zooming abilities. In the span of just one year, all the major camera manufacturers have updated their super zoom cameras to uplift the zooming range which traditionally started at 10x zoom lens to 30x and more. Want to grab one such compact camera! Check out this list of 7 ultra zoom compact cameras and pick the one which best suits your needs. Nikon released three compact cameras in the super zoom series this year with Nikon Coolpix L120 featuring 21x optical zoom, S9100 offering 18x optical zoom and P500 breaking the bounds with 36x optical zoom — featuring a massive focal length of 22.5 mm at wide angle to 810 mm for telephoto range. This 12.2 MP camera is being viewed as the refurbished version of P100 (with 26.1x optical zoom). Engadget sums P500 as another dose of what P100 served up — convenience in a compact package. Not too very compact, the camera is power packed with DSLR like features. 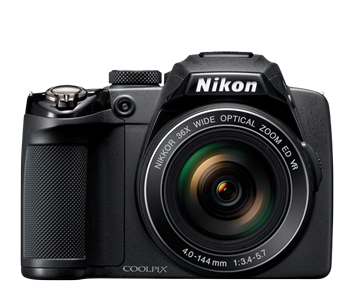 Focusing on the creativity and the convenience offered by Nikon Coolpix P500, it strikes a fair deal at $376.95. [Head on to Photography Blog for a comprehensive review]. 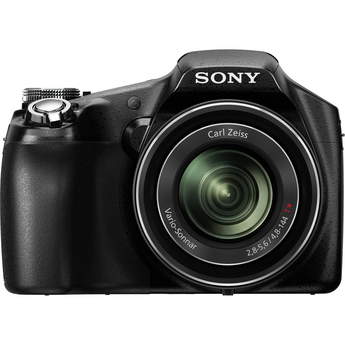 Sony Cybershot HX100V is a 16.2 MP camera featuring an optical zoom which covers 30x zoom with the focal length range equivalent to 27-810 mm. Other than the ultra zoom 30x zoom range, the camera also features GPS, intelligent sweep panorama, full HD 50p movie recording (with zooming ability) and 3D imaging. It also features a manual focus switch on the lens barrel to turn on lens manual focus mode when taking macro shots. With these add-on features Sony Cybershot HX100V stands in stiff competition with Nikon P500 (36x zoom range) and Canon’s SX30 IS 35x optical zoom. For a price of $449.94 approx. You can bring home this long lens camera implementing Exmor R CMOS Sensor and optical steady shot system for optimized the image quality. Get it here. 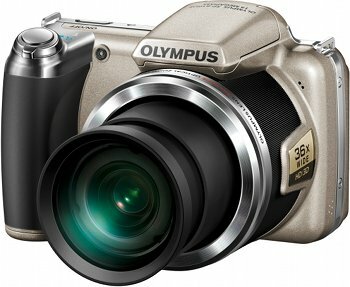 Announced on 27 July 2011, Olympus SP 810 UZ is a 14 MP camera featuring 36x optical zoom; with its focal range spanning in the range of 24-864 mm equivalent. While its TruePic III+ Image Processor, dual stabilization, shadow adjustment technology, ISO sensitivity in range of 80-3200 ensures overall good image quality, it lags behind serious DSLR owing to the lack of manual modes. Priced at $329.99, the camera is all set to succeed the prestigious SP-800UZ. Get it here. In the ultra zoom league of compact cameras, Canon contributes with its latest camera SX40HS. 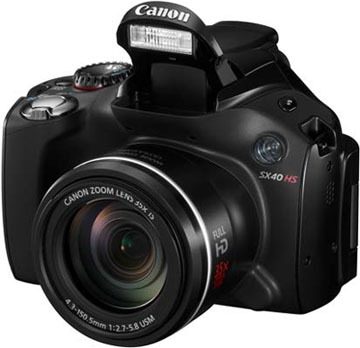 Canon SX40 HS is primarily an upgrade version of SX30IS featuring same 35x zoom lens powered by DIGIC 5 image processor. This 12.10 MP camera covers the same focal lengths as provided by SX30IS i.e. ranging from 24 mm wide-angle to 840mm equivalent telephoto. Unlike Nikon P500, Canon implements lens-based image stabilization. Priced at $429.99 approx., the camera holds good promise on the fronts of color and noise performance with major improvements in internal design. Get it here. Panasonic announced its latest addition to super zoom series on 26 August with Panasonic Lumix DMC FZ150 featuring 24x optical zoom. This 12 MP camera covers a focal range of 25-600mm equivalent. 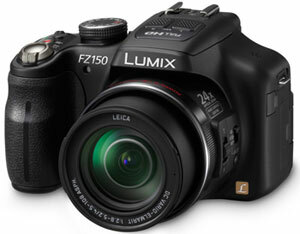 Panasonic Lumix DMC FZ150 incorporates Nano Surface Coating to enhance the optical quality. One feature which sets Panasonic’s super zoom compacts from the others in the similar range is its ability to shoot RAW. The camera is priced at $499.99. For a comprehensive list of features and specifications refer dpreview’s announcement. Get it here. Samsung WB750 is a new travel zoom camera featuring 18x zoom lens (24-432mm equivalent). This 12.5 MP CMOS sensor camera features a dual capture mode allowing you to take still images even while recording full HD video. Priced at $279.99 WB750 is longest ever zoom in Samsung’s compact camera series. To entice the buyers, the camera also provides a host of panorama features like action panorama, live panorama and 3D panorama. All in all, Samsung WB750 can be viewed as a creative tool for casual photographers. Get it here. 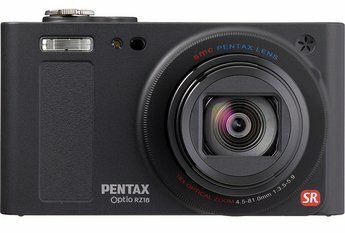 Pentax has recently announced an all new travel zoom camera — Pentax Optio RZ18 featuring 18x optical zoom. This 16 MP CCD sensor with dual shake reduction technology spans in the zoom range of 25-450mm equivalent. Priced at $299.95 approx. with all the bells and whistles, the sleek and slim avatar of super zoom compacts is likely to hit the stores in October. Get it here. 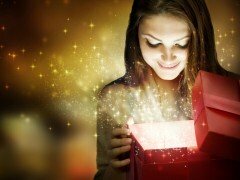 This list presents just the teaser of latest super zoom compacts offered by various camera manufacturers. The options however are unlimited. Just type in super zoom / ultra zoom compact camera in Google search to get an idea about this fast growing market. 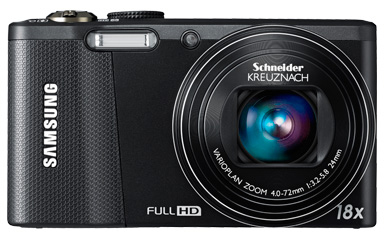 Btw which super zoom compact suits your budget to accompany you on your next vacation?